Utilizing positive effects of social media for communication and collaboration in coporarate and administration projects is still in infancy. This encouraged us to configure a Social Network Software from components of open source software elgg (www.elgg.org). 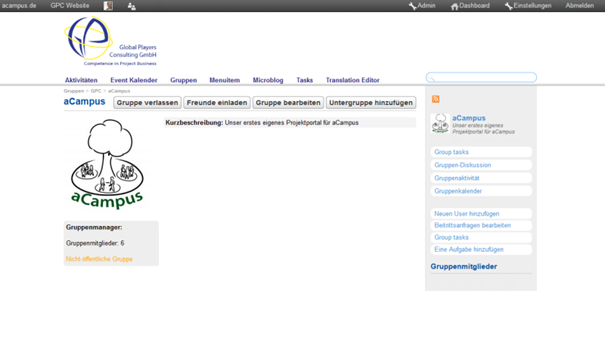 We offer our solution named aCampus as a social intranet to companies and adminstrative units. acampus by Global Players Consulting – SIMPLY NETWORKED! Teams frequently work across several locations and countries in project-oriented businesses . Co-location is not viable for economic reasons. This makes a central medium all the more important where project team members can communicate, share information and work on a common platform.